197, 6 p., 7 leaves of plates : ill. (some col.) ; 17 cm. "Truth is I:. I ." 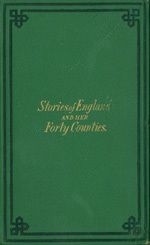 "Stories of Scotland',"
"Stories of Ireland," "Daughters from Home,"
JARROLD & SONS, 3, PATERNOSTER BUILDINGS. the child has heard the story of Mary, Queen of Scots. volume will greatly fail without its assistance. pleasantest thing to seeing them for ourselves. of your own but of other countries also. of East and West I will tell you presently. much better than I can describe it. told you, have all names given to them. some large river, or reach the sea. than yourself to tell you its meaning. South of England from the South of Wales. are called the British Isles. North and West-the Irish Sea or the St.
England alone that I shall speak. to know that are not very amusing to learn. the names of which you will hear in time. owing to his perseverance and labour. at Newcastle, and the country around. some depth in the ground, we come to water. called) went down in the bucket with him. quite still, and lay fast hold of the rope." sometimes sad accidents occurred to the men. taking away too many of the coal pillars. way in which it burns when danger is at hand. the two countries of England and Scotland. pose for which it was built. seems to have been pretty much the same. suppose from its name, was a moveable bridge. gate were rooms for the porter or gate-keeper. idea of the general style of such buildings. please you to hear about it. tempted us to buy some to eat on our journey. is called a city. You must remember this. unless it has a cathedral in it. battles were fought, to get possession of it. in England. 'She never returned to Scotland. way in which this was done I will tell you. beneath the rich folds of her velvet dress. rises 3300 feet above the lake Bassenthwaite. the beauties of the lake and mountain scenery. ties of the country and mountains around. ---- :! -___-_-+- : _;- -. :-' '_ ? :. ...-. .
"VIEW OF KESWICK AND DERWENTWATER. and another piece of wood is glued over. Cedar is generally used for the purpose. and time than I have at present. est. It is something the shape of a vine leaf. have not a very nice appearance alone. have not some manufacture or other. be very interesting to you. weaving, at which they were very expert. west, and to the east is the German Ocean. battle fields in a day of blessed peace. quantities from Germany and other countries. England. It is divided into three parts called. without the leave of the gate-keeper or porter. size is noted for some manufacture. one parish church and a few narrow streets. "pretty little market town" of which he wrote. would puzzle without instructing you. famous for making knives and scissors. Richard that he came to the throne so young. name of the Dropping Well of Knaresborough. with some of the earth collected in its course. means its most important town, is Lancaster. Lancaster stands in a very pretty situation. ones; or, at least, with such as you commit. and then how easy was his path downwards. pouring, have not a pretty effect. blossom of the cotton-plant is of a pale yellow. peas are familiar to every child. and sent to England and other countries. it would only be confusing to you. and soft, like wreaths of snow. I must tell you something about a port. them with the sea, or on the sea-coast itself. one of which Abraham buried his wife Sarah. -' - ~ f ..
divided from England by the sea. Denbighshire and Flintshire to the west. from springs or sea-water is by evaporation. out and placed in a shed to dry. INTERIOR OF A SA INE. earthenware, and as manure, it is also useful. Saxon language, signifying a salt spring. is built is so soft, that it is crumbling away. smelting is carried on at Coalbrook Dale. to take his life as well as his crown. obliged to comply. And now for the "Oak;"
we have been a long time travelling there. where he was shown into a secret chamber. as to who was the master cook at Boscobel. interesting as the story of Charles in the oak. or any other ingredient with the best cider. is Hereford, and stands on the river Wye. west, and the Bristol Channel on the south. is burnt in the kilns on the spot. like kings (Henry V.) was born. little of the people who lived in these places. peace, in all at least who profess to love Him. used to copy a great many on parchment. fifteen steps up to the abbot's seat. M onk at his Devotions. world which they professed to have left. for the sake of true religion. which God deigned to hear and answer. building must have been a fine sight indeed. at one time. We will begin with DERBYSHIRE. ful and curious productions in Derbyshire. 8 2 Stories of England. feathery fir trees, and thick green brushwood. break off the sides and roof of the cave. Matlock is a famous place for curiosities. and leave nothing but the petrifaction. which I wrote in the early part of this book. and waited till the heavy door 'vas opened. folks now, being as early as twelve at noon. beer was drank both at breakfast and supper. the jesters affected their oddities and follies. were enough to turn his brain, I should think. the cracks left in the windows and doors. which you are requested not to sit down. repair, though the embroidered quilt is faded. but keeping them close to work. now, which their husbands would like to eat. England led some hundred years ago. scalded her hand. Made a poultice for Rachel. Ten o'clock. Went to dinner. Four o'clock. Went to prayers. Six o'clock. Fed the hogs and poultry. hours very disagreeable. Fell asleep. Garrick, a great theatrical performer. squeezing the soft clay into moulds. earthenware was of no use for anything liquid. the biscuit, gives it a sort of glassy polish. the oven, and the baking is completed. mens of very early pottery. the designs with which they are ornamented. Staffordshire, are large manufactories of hats.